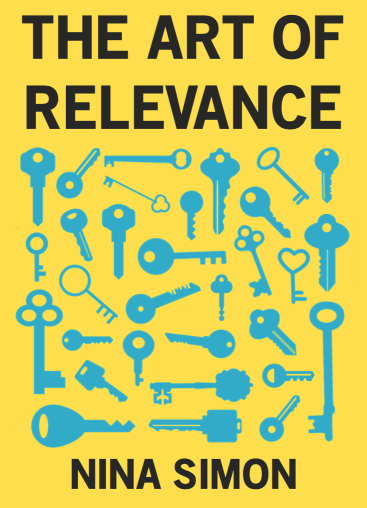 So how do you create relevant work? Whether you use the language of wants or needs, strengths or assets, doing relevant work comes down to the same idea: creating projects that speak to the people you wish to engage. At our museum, we’ve gravitated towards a “community first” program planning model. It’s pretty simple. Instead of designing programming and then seeking out audiences for it, we identify communities and then develop or co-create programs that are relevant to their assets, needs, and values. Define the community or communities to whom you wish to be relevant. The more specific the definition, the better. Find representatives of this community–staff, volunteers, visitors, trusted partners–and learn more about their experiences. If you don’t know many people in this community, this is a red flag moment. Don’t assume that programs that are relevant to you or your existing audiences will be relevant to people from other backgrounds. Spend more time in the community to whom you wish to be relevant. Explore their events. Meet their leaders. Get to know their dreams, points of pride, and fears. Share yours, too. Develop collaborations and programs, keeping in mind what you have learned. The first step to this “community first” process is identifying communities of interest and learning about their assets, needs, and interests. How does this critical learning happen? There are many ways to approach it. You can form a community advisory group. Create a focus group. Recruit new volunteers or board members. Hire new staff. Volunteer in that community. Seek out trusted leaders and make them your partners and promotores. Seek out community events and get involved. I find that the more time my team spends in communities of interest, hiring staff from those communities, recruiting volunteers from those communities, helping out in those communities, and collaborating with leaders in those communities, the easier it is to make reasonable judgments about what is and isn’t relevant. It gets easier to hear their voices in our heads when we make a decision. To imagine what they’ll reject and what they’ll embrace. Once we’ve identified assets and needs, we seek out collaborators and project ideas. We don’t start with the project idea and parachute in. We start with the community and build to projects. With new communities, that can mean launching new relevant projects. In 2013, our Youth Programs Manager, Emily Hope Dobkin, was driven to find ways to support teens at the museum. She started by honing in on local teens’ assets: creativity, activist energy, free time in the afternoon, and their needs: desire to make a difference, desire to be heard, desire to belong. She surveyed existing local programs. The most successful programs fostered youth leadership in various areas like agriculture, technology, and health. But there was no such program focused on the arts, despite a huge population of creative youth. The assets and needs were there, and Subjects to Change was born. Subjects to Change is a program that puts teens in the driver’s seat and gives them real responsibility and creative leadership opportunities at our museum and in collaborations across the county. The teens host events. They launch creative projects. They bring art to local activist efforts around the issues that matter most to them. They advocate for change at the museum and throughout the community. Emily supports them, but she doesn’t lead them. Subjects to Change isn’t rooted in our museum’s collection, exhibitions, or existing programs. It’s rooted in the assets and needs of creative teens in our county. The program works because it is teen-centered, not museum-centered. Sometimes, we get to know a community and realize we have complementary needs and assets. Across our museum, we’re making efforts to deeply engage Latino families. One of their greatest needs—as expressed by Latina moms we interviewed—is to connect their children with the cultural traditions of their homeland. So we started looking for organizations with strong assets in these areas. We honed in on the community of Oaxacan culture-bearers in the nearby Live Oak neighborhood, many of whom are connected through a grassroots organization called Senderos (“pathways” in Spanish). Senderos puts on an incredible annual Guelaguetza festival, which brings together thousands of people for a celebration of Oaxacan food, music, and dance. Our Director of Community Engagement, Stacey Garcia, reached out to the Senderos folks who run the festival, hoping we might be able to build a partnership. Stacey went into that first meeting eager to learn how collaboration might benefit both organizations. She knew that Senderos could help us address one of our institutional needs—the desire to connect with Latino families. But what did we have to offer them? Stacey walked out of that first meeting beaming. It turned out we had similar goals around community engagement but were approaching it from different perspectives. Each of us wanted to reach more people in our community. They had an easy time reaching Latino audiences and a harder time connecting with white people. We had a strong white following and weaker connections with Latinos. Senderos wanted to introduce our audience to their work just as much as we wanted to connect their audiences to our work. We discovered–together–that each of us had assets that served the other. They had music and dance but no visual art activities; we brought free hands-on art projects to their festival. We built a partnership in which we each presented at each other’s events, linking our different programming strengths and audiences. We started doing more and more together. No money changed hands. No new programs were born. It was all about us amplifying each other’s assets and helping meet each other’s needs.